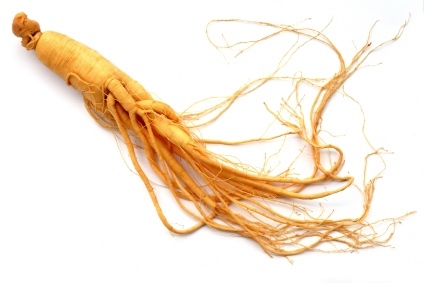 Panax Ginseng Traditional chinese medicine, named also Asian Giseng, Chinese Ginseng, Korean Ginseng, Asiatic Ginseng, has been used by alternative medicine and as a powerful health supplement for more than a 5000 years. Huge demand for Ginseng from all over the world followed to the commercial cultivation of Ginseng which continues to this day. Ginseng is of the better known adaptogens, generally known to be as Safe Health Food Supplement. Dry mouths and lips, blurred vision, increased body temparature, decreased eppetite, increased sexual desire, dittiness, itching, fatigue, high blood pressure, nausea, headaches, restlessness, inability to sleep, diarrhea, nose bleeds, low blood pressure, breats pain, function of mania in depressed patients mixing it with antidepressants. 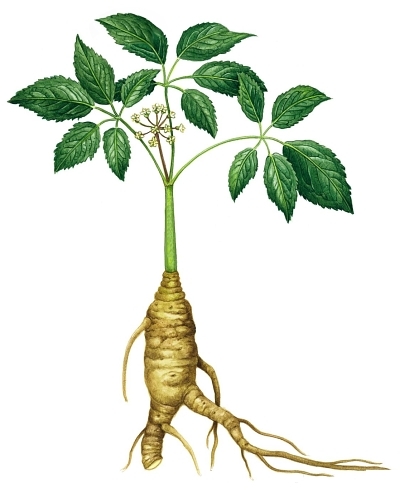 However, Ginseng is commonly considered to be safe even in large amounts. Increases Yin Energy (Shadow, cold, negative, female), cleans excess Yang and calms the body. This is because according to Traditional Chinese Medicine, plants living in colder places are strong in Yang Energy and vice versa. Increases Yang energy (sunshine, hot, positive, male), improves circulation and blood supply to all vital organs, improves recovery from weakness after illness, increases energy of the human body. White Ginseng is a Dried Fresh Ginseng, four years old, peeled and air dried in the sun to 12% or less water content. Red Ginseng Harvested after 6 years, not peeled, steam-cured at 100 °C (212 °F) to change its biochemical composition and to preven the breakdown of the active ingredients, then dried. Increases sexual function and human body energy. Red Ginseng is produced from cultivated roots, usually from Korea. Studies had shown that it can be an effective alternative for treating male erectile dysfunction. The study investigated the efficiacy of Korean Red Ginseng for erectile dysfunction according to the International Index of Erectile Function. 45 patients with clinically diagnosed dysfunction were taking 900 mg Ginseng Daily Dose (3 times daily). Mean International Index Erectile Function scores were significantly higher in patients treated with Korean Red Ginseng. 60% of the patients answered that Korean Red Ginseng improved erection which concluded that it can be effective alternate for treating male erectile dysfunction. Steamed at 120 °C (248 °F) for three house. Not as commonly found as Red Ginseng due to the increased nitric oxide, superoxide, hydroxyl radical and peroxynitrite compared with conventionally processed Red or White Ginseng. Is the one that grows naturally and is harvester from wherever it grows. As it requires years for a root to reach maturity, wild Ginseng is relatively rare. Actually is becaming increasingly endangered, also due to the high demand for the Ginseng Roots in recent years. Wild Ginseng can be either Asian or American, and can be processed to be red Ginseng. Improves overall health of human being. According to the Chinese book of herbs it Enlightens mind and increases wisdom, cures lethargy, arthritis, impotence, senility and many other conditions. Adaptogen - substance that assist the body to restore itself to health and work without side effects even if the recommended dose is widely exceeded. Positive Effects on Sports Performance.